Have leftover crawfish etouffee? 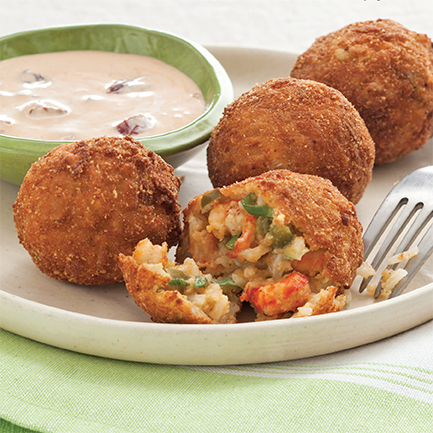 These fried crawfish etouffee balls are a phenomenal encore. In a large bowl, stir together Quick Crawfish Etouffee, ¼ cup bread crumbs, rice, green onion, hot sauce, salt, cayenne, and 2 beaten eggs. Chill for 30 minutes. In a medium bowl, whisk together remaining 2 eggs and milk. Place flour in a separate medium bowl. Place remaining 2 cups bread crumbs in a third medium bowl. Scoop étouffée mixture into golf-ball-size rounds. Roll each ball in flour, then egg mixture, then bread crumbs. Place on a baking sheet and refrigerate until firm or up to 24 hours (see note). In the work bowl of a food processor, combine ranch dressing, chipotles in adobo, garlic, seasoned salt, and pepper. Pulse until combined. Set aside. In a large pot or Dutch oven, pour oil to a depth of 4 inches. Heat over medium heat until a deep-fry or candy thermometer reads 350º. Fry balls in batches for about 3 minutes or until golden brown. Serve hot with ranch dressing mixture. Balls may be frozen at this point in step 3. Place balls on a baking sheet, and freeze until completely solid. Transfer to a heavy-duty resealable plastic bag, and freeze for up to 6 months. Let thaw in refrigerator overnight before frying. In a large pot or Dutch oven, melt butter over medium heat. Stir in flour, and cook about 10 minutes or until mixture is the color of peanut butter. Add onion, celery, and bell pepper; cook about 6 minutes or until softened. Stir in crawfish, salt, pepper, and Creole seasoning. Reduce heat to low; cover and cook for 15 minutes. Let cool completely before making balls. Etouffee can be refrigerated for up to 1 week or frozen for up to 6 months. After you prepare the crawfish balls can they be frozen and for how long? There is a note under the recipe detailing the freezing/thawing instructions; the prepared (but not fried) crawfish balls may be frozen up to 6 months. Just thaw them in the refrigerator before frying. Enjoy! 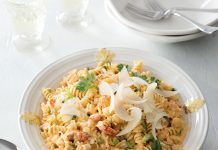 Can I use my own etoufee recipe? Or is there something bout the texture of theirs that makes it stay together while frying? 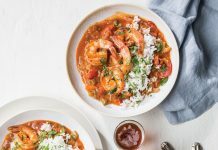 You can certainly use whatever leftover etouffee you have on hand! Is there a dipping sauce to go with it? There is! In Step 4, you will make a ranch/adobo dipping sauce. What other oil would you recommend if someone is allergic to peanut oil? A high-heat cooking oil would be ideal for this, so you can use canola or vegetable oil instead. Hmm…I think we’ve got just the thing. How about this one? It’s a Praline Bundt Cake with Salted Caramel Sauce. how many packs of crawfish tails to serve 100 people? Hi Beredia! Seventeen (16-ounce) packages of crawfish tails should be enough to serve 100 people.